I couldn’t resist including a number in this post’s title – 255 seems like a nice number to end the year on! I find it amazing to think that its 1 year ago that Mike Gunderloy hung up his .NET hat and ceased publishing The Daily Grind and moved on to all things Ruby on his new blog A Fresh cup. I had enjoyed the Daily Grind immensely for the previous few years, and was saddened by it coming to the end, so I decided I had to carry on the tradition. The first few editions of The Morning Brew were actually called ‘Morning Coffee’, until I discovered that Harry Pierson had a series of posts also called Morning Coffee, so after a quick rethink I settled on the name ‘The Morning Brew’ which stuck (apart from a typo incident in ‘The Mroning Brew #242’ – a mistake I make most mornings when typing the title, so its incredible that it took 242 editions for it to make it out onto the web. Keyvan Nayyeri and Davy Brion. Many thanks to all these folks and to everyone else who has linked to the Brew this year – without readers I suspect I would have ceased publishing. It was about February when I started to get some feedback from readers (who I didn’t already know personally) – some were suggestions for links, others were interested in advertising (something I’m still not quite ready for yet) and others were just nice feedback – thanks to anyone who has contacted me so far, and I’d really like to encourage others to drop me a line with any comments, feedback or link suggestions – I can’t promise that they will all get implemented or published, but I’ll certainly consider them. Putting The Morning Brew together each morning takes up to 1.5 hours, and is the second thing I do each morning (the first being brewing a strong and large cup of coffee). I currently monitor 401 individual feeds, some of which are aggregate feeds like the blogs.msdn.com feed. According to Google Reader’s Trends feature I read over 10000 posts a month (approx 120000 posts a year), which would seem to fit with the 500 or so posts that I see each morning, selecting the best 10-15 posts for inclusion in that days edition. Since the Morning Brew began I have been using Ma.gnol.ia to manage the links, with a simple winforms application to grab them from their API and format them into my HTML structure. The rest of this analysis is based upon an export from Magnol.ia taken this morning. 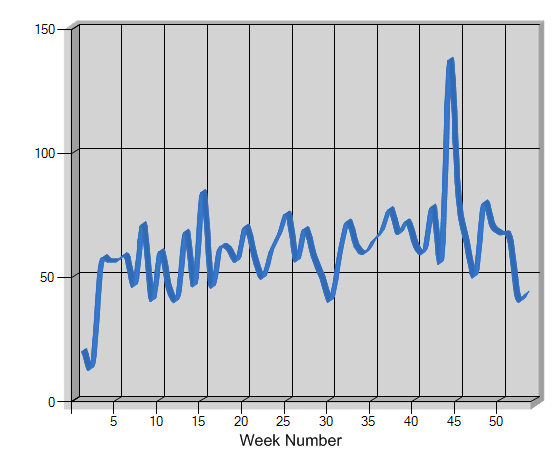 The big peak in this graph is PDC week (44), where I had over 130 links in that one week – that was a busy week, putting the brew together took about 4 hours every day that week. 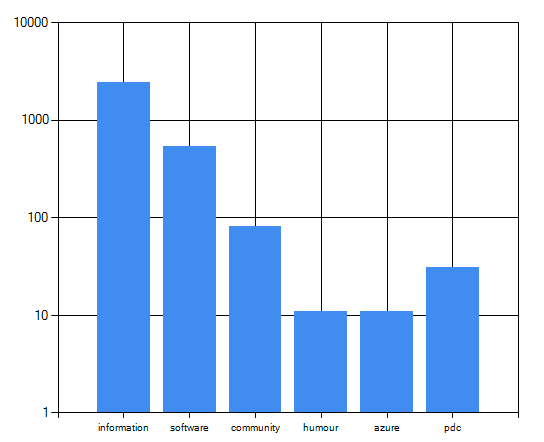 No surprises here – with the information category clearly having far more posts than any other section. This one is my attempt to show that The Morning Brew encompasses the log tail of the .NET blogging world, with some popular blogs getting over 100 links over the year, yet also having a huge number of blogs which have only been linked to once. of which 800 recieved less than 5 links over the course of the year. Once again I’d like to thank all the bloggers, researchers, and developers who publish their thoughts and code online, the readership of this Blog for sticking with me, and the array of different coffee’s that have made posting every morning possible! In keeping with Brew tradition, there will be no Morning Brew tomorrow as it is a UK Public Holiday, so edition #256 will be published on Friday (2nd). Examining the Dependency Inversion Principle – Derek Greer talks at length about the Dependency Inversion Principle giving a quite academic view of what it is all about. The Making of the Virtual Earth 3D Santa Tracker – Chris Pendleton talks about the construction of the 3D Santa Tracker built on top of Virtual Earth, talking about how he created the application and sharing some of the code involved. What Would You Choose For New .NET Web Development? – Davy Brion explores the options for building a web application using the .NET framework. Introducing the ASP.NET MVC (Part 2) – ASP.NET MVC vs. ASP.NET Web Forms – Nick Berardi shares another chunk of his book on ASP.NET MVC, this part looks at the benefits and limitations of ASP.NET MVC and Web Forms and gives a way of deciding which to use for a particular project using a scoring system. Lee Dumond highlights TheBeerHouse MVC Beta Now on CodePlex which is a beta release of the application built for this book. Making the Entity Framework Fit Your Domain – Part 1 – Justin Etheridge explores the Entity Framework looking at how he could integrate it with his application architecture by making it work the way he wants. Looking forward to further parts of this series. ASP.NET MVC View Engine using VB.NET XML Literals – Dmitryr explores using the VB.NET XML Literals as a view engine for ASP.NET MVC – interesting idea as it gives some compile time checking of the HTML being output. SQL Server Management Studio 2008 suggests missing indexes with actual execution plan – Mladen Prajdi? highlights a nice feature of SQL Server Management Studio 2008 which identifies missing indexes and illustrates the performance boast their presence would give. Do not put presentation concerns in the controllers! – Ayende stirs up some great debate about ASP.Net MVC best practices with this post on controllers containing page titles and the like, and also in this post on his baseline ASP.NET MVC modifications looking at parts of the framework he disables to prevent use.